Make and Upload YouTube Videos Easier - RZSoft announces a new product Youtube Movie Maker; now customers can use Youtube Movie Maker to make and upload YouTube videos easier. RZSoft announces a new product Youtube Movie Maker. In this new release, customers are now able to make and upload YouTube videos from various videos/movies, pictures/photos, music/audios, lyrics/texts, etc. As is well known, YouTube is the most popular website for video sharing in the world; more and more people love to create their own channel to share their videos with others, such as singing videos, birthday party videos, graduation nostalgia party videos, home life videos, product presentation videos, etc. Many people had used Windows Movie Maker, Premiere, Vegas, etc, and always met problems when using these softwares. For example, some files can't be imported into the software, or the created videos can't be uploaded onto YouTube, or the uploaded videos can't be processed on YouTube, etc. There are many different reasons, such as video format problem, video profile problem, video size problem, video length problem, etc. The users have to spend a lot of time using converter software to convert various videos to the right format and profile. So many people have complained about these problems -- is there a way to solve these problems? Yes, the answer is yes. RZSoft's goal in this product release is to assist users to make and upload YouTube videos easier, also help the users solve these problems, Youtube Movie Maker supports all popular formats video files, so that the users wouldn't need to worry about the video formats any more. Youtube Movie Maker have optimized for YouTube. It supports all YouTube video profiles, include 240p, 360P, 480P, 720P HD, 1080P HD, to make sure that the created videos can meet all the requirements of YouTube. Easy to use, even a newbie can easily make and upload videos onto YouTube and would't need to convert videos between different formats any more, or worry about whether the created videos can be uploaded onto YouTube successfully. Below there are two samples about how to use Youtube Movie Maker to make and upload videos onto YouTube. The First Sample: Make videos then upload onto YouTube. First Step: Need to download and install Youtube Movie Maker from the official website, this software provides the Free version and the Paid version, both free and paid version won't add watermark on the created YouTube videos, the Free version just limits some advanced features. Access the official website to view the detailed difference between the different versions. 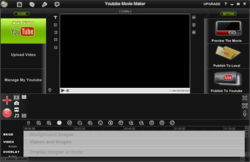 Second Step: Run Youtube Movie Maker, select the "Make Video" module. Users will view a big red plus sign button (add local files button) on the right of the file list. Press this button to add different types of files (include video files, audio files, image files, icon files, etc.) into the file list as the resources. Of course, the user also can directly drag and drop any type of files from the computer hard drive into the file list as the resources. Third Step: Start to make video, choose the resource file which needs to be edited, then press the "Add to TimeLine" button in the left of the file list to add the resource file onto the TimeLine zone. Of course, the user also can directly drag and drop the resource files from the file list onto the TimeLine zone, then edit these resources. For instance, such as cut, split, crop, re-size, add special effect, add transition effect, add lyrics/texts, add sign/logo, etc. Forth Step: Press the "SETTING" button, select a video profile which will display on YouTube, include the video file size (input a smaller size to compress the created video file, shorten the uploading time) and the video resolution (240p, 360P, 480P, 720P HD, 1080P HD), etc. Of course, the user also can use the default setting directly. Fifth Step: Preview the created video by pressing the "Preview The Movie" button, or press the "Publish To YouTube" button. The software will upload the created video onto Youtube directly, or press the "Publish To Local" button to save the created video on computer hard drive for future uploading. The Second Sample: Batch upload various videos onto YouTube. First Step: Run Youtube Movie Maker, select the "Upload Video" module. You will then view a big red plus sign button (add local files) on the right of the file list; press this button to add source video files into the file list. Don't worry about video formats and profiles. Users can also drag and drop source video files directly from the computer hard drive into the file list. If there is a video file which is longer than 15 minutes (YouTube limit single video file MAX length 15 minutes), the user can simply right click the video file in the file list, then select "DIVIDE INTO PARTS" to auto split the long video file to several short parts. Of course, the user also can directly remove the unwanted parts from the video by setting new start time and end time. Second Step: Input video Title, Description, Tags, Category, etc, and Youtube Movie Maker provide a "intelligent editor". Through this editor, the user can add Title, Description, Tags, Category, etc, info. to many videos at the same time, that's very useful for users to upload the series of episodes. Third Step: Press the "SETTING" button, select a video profile which will display on the YouTube, include the video file size (input a smaller size to compress the created video file, shorten the uploading time) and the video resolution (240p, 360P, 480P, 720P HD, 1080P HD), etc. Of course, the user also can directly upload the video files onto YouTube with the default setting. Forth Step: Press the "Convert&Upload" button, the software will auto convert and upload all source video files onto YouTube. If the user want to do other things, like sleep or do something outside, etc., just simply check "Auto shutdown computer when finished" option, don't need to keep a weather eye on it nervously in front of the computer.